From the 18th July to the 27th September, the Archibald, Wynne and Sulman Prizes, and art event, takes place at the NSW Art Gallery so if you’re heading to Sydney, add this to your calendar. With its first award in 1921, this is the country’s most prominent and favourite art recognition event. As a highly prestigious Expo, the Archibald Prize brings together a who’s who of Aussie culture including artists, sports heroes, celebrities and politicians. The Wynne Prize award focuses on the best landscape painting of the country’s scenery, or it may be a figure sculpture who grabs the prize – who knows? Finally the Sulman Prize is awarded to the best genre painting, mural (oil, watercolour, mixed media and/or acrylic) or subject painting. Annually, the Art Gallery of NSW trustees judge the Wynne and Archibald Prizes, where as invited judges focu on the Sulman Prize (this year’s being Jenny Watson). There’s also a People’s Choice Award category so you can vote for your favourite – it’s all about the attendees, right? Since it established in 1871, the Art Gallery of NSW heavily supports fine international and native art in one of the globe’s most stunning art museums. From contemporary and modern collections to exhibitions, programs & lectures to the Brett Whiteley Studio, the Gallery is a mecca for locals and visitors looking to educate their inner artistic creativity. Online tours are also available or you can search the entire collections on their website, so you can plan exactly what you want to see before you arrive in Sydney. Fancy checking out the Gallery late in the evenings? Each Wednesday, the venue hosts an ‘Art After Hours’ event where displays are available for viewing until 10pm and the stores, cafes and galleries until between 9.00-9.30pm (check the link above for each specific closing time). Not only is general admission free (yes free), but the Gallery also runs a courtesy bus every 15 minutes from 7pm until closing on Wednesdays to surrounding car parks and Martin Place. From Martin Place, you can take a leisurely 10 minute stroll to Circular Quay and hop on the ferry. 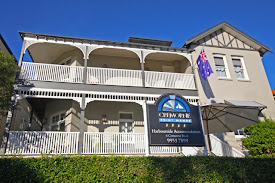 Within a few minutes, you’ll be at Cremorne Point and six minute walk later, arrive at Cremorne Point Manor. The views of the city on the ferry and also at the Manor are sensational, voted one of the best skyline scenes by tourists and locals alike. Want to see what we see every day? Check our home page video and yes, the Harbour Bridge and Opera House are in our peripheral vision daily - talk about a canvas worth gloating over. Contact us about our winter deals and once you’re here, will give you more tips on more great attractions to visit!